The official Twitter app for iPad has been released today, with a host of new features to keep Twitter fiends happily poking away at their Apple tablet's screen for the foreseeable future. Twitter's official iPad app is far more than a mere expanded version of the iPhone app, offering an entirely new-looking interface which lets users see links to webpages, pictures and videos from tweets almost immediately in a new pane on the screen. Twitter for iPad also makes really good use of the iPad's multitouch interface. For example, you can pinch outwards to get more information on a particular user whose witty tweets you might be reading at any given time or you can swipe down with two fingers to reveal the whole conversation. 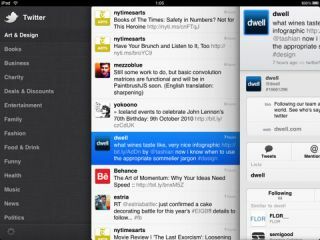 "Today we are bringing Tweets to a device that really lets content shine - the iPad", says Twitter on the company's blog. "Twitter for iPadtakes advantage of the iPad's fluid touch interface, letting you move lots of information around smoothly and quickly - without needing to open and close windows or click buttons".